Templates of mixer sections can be created by dragging a mixer section to the Add Track menu button and dropping it there. A small window will pop up where you can specify the name of the template. The Add Track menu will show an 'expander' icon on the left if templates are available for a certain mixer section type. After clicking it the menu shows the templates. If you click a template a mixer section will be added based on the template (ie. it will have the same effects, the same volume fader level etc.). 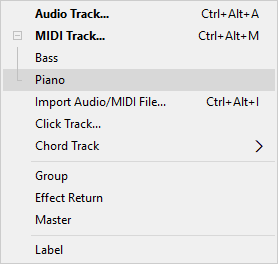 Tracks will also have a new audio or MIDI file, you'll be prompted for a name before the track is actually created. Examples of templates include MIDI track templates for your favorite instruments, and audio track templates for your favorite vocal effects. Templates can be renamed or deleted by right clicking them. They can also be deleted by dragging them to the garbage bin.